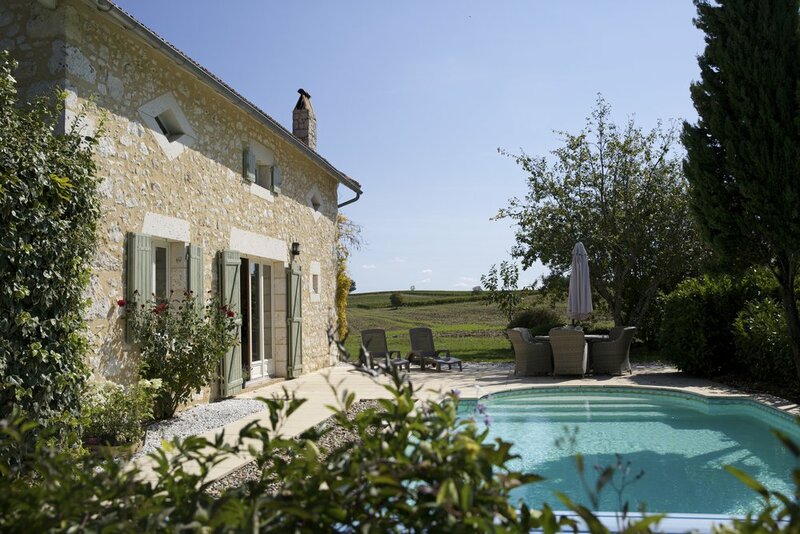 I am so excited about this new retreat in the Dordogne region of France.......imagine rolling countryside, vineyards, fields of sunflowers.....and the charm and style of the France. Just to whet your appetite.....imagine views across beautiful French countryside to the vineyards beyond, 3 amazingly styled French luxury cottages arranged around two outside pools, one a heated saltwater pool....the most wonderful open yurt....for al fresco yoga, a firepit for evening ceremonies, a trip the local chateau for wine tasting......and your meals prepared by an amazing chef who is also a nutritionist who creates menus that are both delicious and healing for us. In each kitchen there is a fully equipped kitchen, (even including a Nespresso machine) as ell as comfortable and gorgeous sitting rooms. The cottages open up to beautiful patio areas and we will eat our meals together as a group, either on the table outside or in the fabulous open sided yurt. In La Verger, there are 2 rooms for sole use; 1 with a king size bed and another with a double bed. The room with the kingsize bed has a balcony and both rooms share a luxury bathroom. In La Peche, there is a double room (for sole use) with an ensuite toilet and basin (and shared bathroom with the twin room downstairs. There is also a stunningly beautiful twin room downstairs. In La Poire, you may choose the twin room that has 2 double beds! or another room that is a another beautiful twin room.......(if 3 friends wish to share this room, it does have 3 beds - so it can be a triple for 3 friends booking together, please contact me for a reduced price for this). My descriptions above does not do justice the beauty of these rooms or cottages. There will be food available in each cottage for a light breakfast before yoga for those who prefer a herbal tea, hot lemon or a coffee and bread, croissant before yoga. We will then have a substantial brunch and evening meal prepared for us and eaten together as a group, either on one of the tables outside or in the yurt. Each meal will be planned and prepared for us by our very own nutritionist chef who will show us how food can be our medicine and how we can enjoy delicious, colourful, flavoursome food that is also healthy and healing for our mind, body and spirit. As the 31st Dec has passed, the EB discount has not expired and the Full Booking price applies. This retreat has sold very quickly and as at 1st Jan there are just 3 spaces left. (If 3 friends wish to share this room it can be sold as a triple - so please contact me for a reduced price if you are interested in this option).